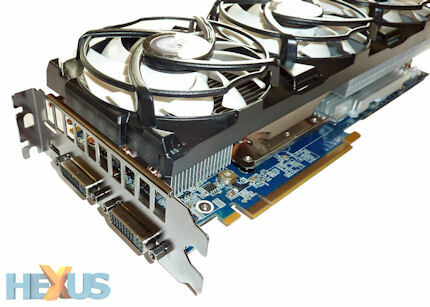 It's now a matter of interest that, to some people, NVIDIA admits its reference GeForce GTX 480 is a hot and noisy card. While it continues to deliver the fastest single-GPU performance around - note that NVIDIA does not claim graphics-card leadership in the face of the twin-GPU Radeon HD 5970 - the GPU company has left it to its glut of add-in board partners to construct heatsink solutions that are both quieter and cooler than the flawed reference design. But efficiently cooling a card that can pull 250W is no mean feat. Many think that watercooling is the way to go for GTX 480, such is the pressure put on removing heat from the large GPU, but a few partners have demonstrated that keeping the beastie's thermals in check, even in factory-overclocked form, can be accomplished by strapping GTX 480 with a huge air-cooled heatsink-and-fan unit. KFA2, one of NVIDIA's newest AIBs, wants to make a statement in the enthusiast segment of the graphics-card market. This is why it desires the fastest air-cooled GeForce GTX 480 in the world. Say hi to the £400-plus GTX 480 Anarchy. The cheapest GTX 480 cards ship with the reference cooler and default speeds of 700MHz core, 1,401MHz shaders, and 3,696MHz memory. Priced from £340, or £50 above the Radeon HD 5870, they provide a reasonable bang-for-buck, if you can stand the noisy cooler. The limited headroom of the range-topping Fermi part means that squeezing extra speed from the chip is a difficult task. Indeed, KFA2's Anarchy, which lays claim to being the fastest Fermi card, is clocked in at 760MHz core, 1,520MHz shaders, and 3,800MHz memory - or less-than 10 per cent quicker than a basic GTX 480. Yet KFA2 appreciates that the reference cooler simply won't cut it once clocks are dialled up. It's replaced by the monster-ish Arctic Cooling Accelero XTREME Plus - a five-heatpipe and three-fan HSF that, the manufacturer says, can tackle any current GPU on the market. A trio of PWM-controlled 92mm fans dwarf the PCB, and the card is a foot long, as measured from the PCI bracket to the edge of the heatpipe. Weighing in at 1,155g, you will need to ensure that it's secured in rather tightly. The triple-slot-taking HSF is only one part of the cooling jigsaw. The Anarchy is supplemented with a rectangular aluminium heatsink on the left-hand side and a much larger heatsink on the right. These are needed to keep the hot-running power-regulation components and PCB-mounted memory cool - a fact that's helped on by the air pushed by the trio of fans. Fire the behemoth up and the fans spin at around 2,500rpm at all times - the PWM seemingly not working correctly - resulting in a bearable whooshing sound when the GPU's idling. You need to install the supplied Xtreme Tuner HD software to reduce the fan's speed to a 2,200rpm minimum. From the default 1.062V, the GPU's juice can be reduced to 0.825V and increased to 1.162V. KFA2 matches the reference card's outputs of twin dual-link DVI and mini-HDMI. There's little need for ventilation cutouts on the bracket though, as the card's fans spill exhausted air all around the chassis. Feeling flush? A second card can be added to form two-way GTX 480 processing and a means by which to run three monitors with 3D trickery. Power is provided by a six-pin and eight-pin power connector on the left-hand side. Looking closer, the PCB misses out on some of the more enthusiast-orientated provisions found on other high-end cards - points for voltage reading, for one. You'd do well to heed the advice on the rear of the card, folks, because the rear heatsink's temperature rises to 64°C after a bout of gaming. KFA2 completes the package with a bundled mini-HDMI-to-HDMI cable and DVI-to-VGA dongle. But that's your lot, which is disappointing when spending over £400 on a graphics card. NVIDIA helps out here by providing purchasers of a GTX 480 with a free Mafia II download key, if the package is bought from one of six approved retailers. Backed up by a two-year warranty - we really think it should be three - the KFA2 GTX 480 Anarchy eschews the reference HSF unit in favour of the gargantuan Arctic Cooling XTREME Plus, which enables the AIB to push clocks up to 760MHz core and 3,800MHz memory. The cost of such esoteric cooling is a retail price that's north of £400. Given such a large sum of money, performance is crucial, so let's now see how it performs.